Custom labels aren’t the most expensive component in your operation. But, they are priceless when it comes to effectively executing important functions. WIthout a label, patient safety and compliance standards are compromised. And although there are stock labels that may satisfy many of your needs, sometimes you require a custom healthcare label. That’s why United Ad Label developed the Custom Label Builder (CLB). It’s designed for hospitals, physicians offices, clinics and more, for the unique applications that are common throughout healthcare. 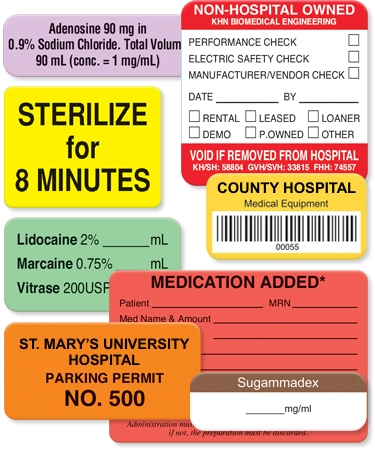 For example, custom healthcare labels identify unique medical treatments and protocols. They serve as an excellent visual reminder and are perfect to reinforce verbally communicated procedures. These are other common healthcare applications. In addition, the custom label builder is a cost effective way to order a standard healthcare label with personalized information including company names, addresses department names and more. Plus, if you need a unique shape, color, design, material or adhesive, it’s a great solution. The possibilities are endless, your healthcare-specific needs or requirements can be easily fulfilled with our custom label builder application. The United Ad Label Custom Label Builder (CLB) makes it simple to design, price, proof and order a custom healthcare label online, and reorders are always just a click away. Try it today!